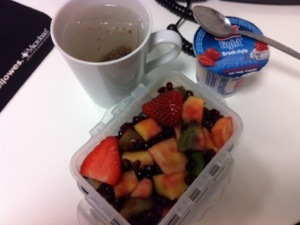 Another day in the office today, breakfast was once again the same, fruit salad, i made a big bowl of chopped kiwi, mango, strawberries and pomegranate earlier in the week and put it in a bowl in the fridge so there’s no faffing when i want some, i also had another Strawberry flavour greek style Muller light (0.5 syns) and some hot water and lemon. 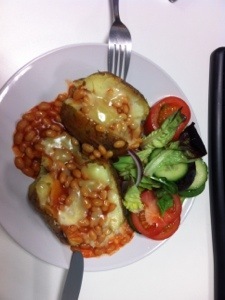 Lunch was some jacket potatoes (well one wasnt quite big enough, but two might have been a bit too much maybe :/) i topped it with beans and 40g of reduced fat cheddar cheese and also made a side salad to go with it. 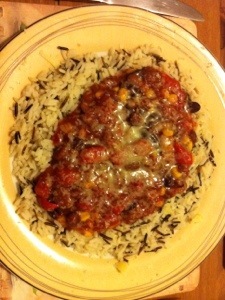 … and i ate it all! 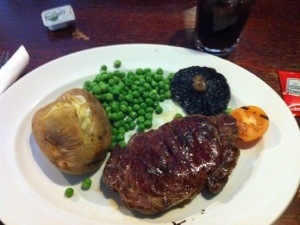 Tonight is usually my weigh in night but as i had a work meal out i will being getting weighed in on Saturday instead. So the meal tonight was at Prezzo, I’d already done some research (good old slimming world Facebook pages) before i went and had decided on the Rigatoni Con Bufala, which was pasta with Buffalo milk mozzarella, sliced cherry tomatoes, onions, garlic and basil in a tomato sauce and i went for a “light” portion which is half a portion with a side salad, it was really nice too 🙂 I really don’t know what the syn value would be but tomato based sauces are usually a good option, the mozzarella would be quite high though as it’s 4 syns per 28g and i guess some oil in the pasta… plus i did nibble on the bread platter starter! 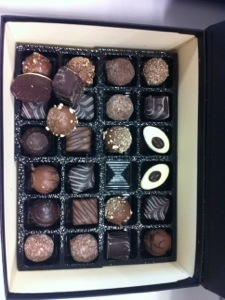 but i did stick to diet soft drinks and we all passed on dessert too. 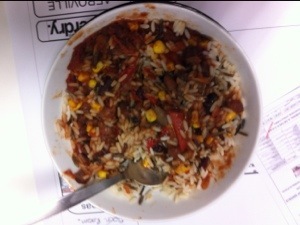 All my work colleagues know I am doing slimming world and are fairly supportive, well, the girls are,…the guys – not so much! Any way I’ve had a good evening which is the main thing, and no more meals out now til after weigh in so if I’m sensible hopefully i wont have done too much damage this week. Plus I did something either very good or very stupid today – I signed up to the 7k run for the end of April, so I have 16 week to get some training in!! none – I think I was being a bit ambitious with trying to do that dvd everyday. 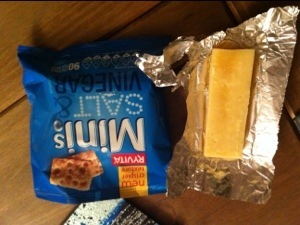 I’d brought a few different things to try this week, one being twinings lemon zest tea, thought I could have this at work so I don’t use all my hexa on milk in tea then I could have some syn free cheese – it was quite nice and refreshing. Also brought some McVities porridge oats breakfast bars, thinking I could incorporate these into breakfast instead of bread, plus the thought of a biscuit sounded great, but after doing some research have found out they are not a hexb and are 3 syns per biscuit, so will be passing those over to my husband to take to work. 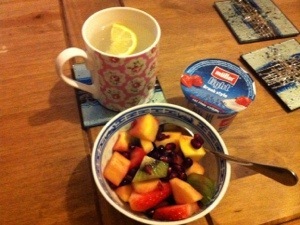 Anyway on with today, breakfast was another fruit salad, fat-free yogurt and lemon tea, getting very repetitive but can’t quite work out whet else to have and at half six in the morning I can’t really manage anything much more complicated! Lunch was the left over from last nights tea, which went down a treat, and as I was feeling rather hungry today also had an apple, sw light bar, banana, satsuma and some cherries. Now, the office “chocolate table” also doubles as a sweet table and today there were 5 big bags of Haribo on there (there were only 7 of us in the office!) so I feel I was very good in only having just two sweets (0.5 syns each) I’m still trying to save a few syns for meals out this week as I know I’m likely to go over. 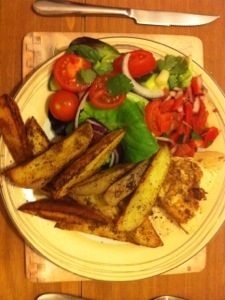 I was out this evening so hubby was in charge of tonight’s evening meal and he’d made a delicious mexican chicken (he used a discovery fajita mix which was 4 syns for the pack) with wedges, home-made salsa and salad. 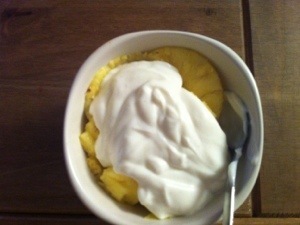 Then another bowl of pineapple with Greek style Coconut flavour Muller Light on top to finish. As I’d promised myself if there was no snow overnight i would get on my bike today and go for a ride, and i woke up to a beautiful sunny day… dam it! no, I do actually enjoy cycling usually but can’t say i was that enthusiastic about it this morning with it being so cold. 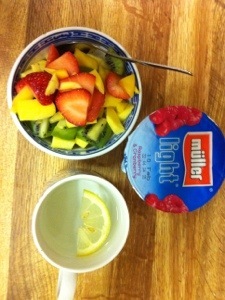 But after a light breakfast (don’t want to be sick!) 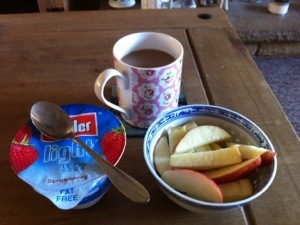 of a chopped apple and Muller light and a mug of coffee, off i went, it was freezing but nice to get out in the fresh air. 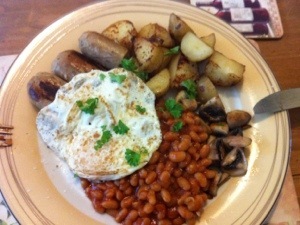 After returning home and getting warm i prepared myself a breakfasty lunch of 2 quorn sausages (2 syns), mushrooms, baked beans, sauteed potatoes and a fried egg, followed by a satsuma and more coffee. The rest of the day was spent out and about doing various bits and pieces that i wont bore you with, but i arrived home in time for dinner. as we had lots of fresh veg in and id bought some Thai red curry paste that only 1 syn per tsp we made a vegetable, noodle, beef type dish that was delicious, but as this is my favorite type of food, i would say that! Obviously i didn’t eat all of that myself! After feeling sorry for myself yesterday due to the “maintain” at weigh in, I’ve pulled myself together today and got straight back on it! I’ve decided not to let it put me off as I’m feeling so much healthier and knowing I’m eating a balanced diet is on the right tack to losing the excess weight so I’m not giving up. Got up late this morning (all that time lying in bed thinking about the above!) 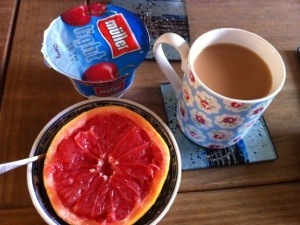 so no time for Pilates before work today, but did manage to eat breakfast (there’s always time for food!) 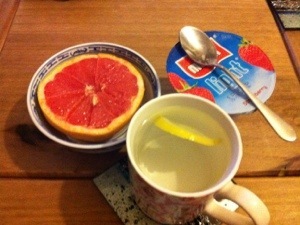 of a superspeedy grapefruit, Muller light and hot water and lemon. 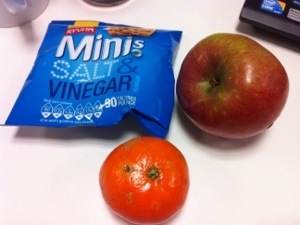 Morning snacks consisted of mini rivitas, apple and satsuma and another one of those bloody chocolates that are sat by my desk, you’d have thought people would have finished them off by now, I reckon could polish the whole box off in ten mins given half the chance! 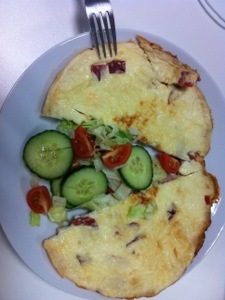 And lunch was a very pale looking but surprisingly delicious omelette made with 3 eggs, half a tub of quark and some chopped ham and roasted red pepper. 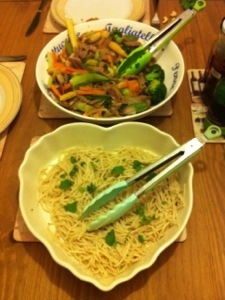 it was really quick to make last night as well, and was nice eaten cold with a bit of a salad. i even managed a little walk to the shops in my lunch break too, it was freezing outside so unsurprisingly none of my colleagues fancied joining me. Now, I was so pleased with my 2lb loss last week that i booked a little non-food treat of an aromatherapy massage for tonight at my gym (got to make use of this membership somehow) very relaxing and a nice little reward to help keep me going. So it’s Friday night which defiantly calls for a curry, I’d made some tomato soup earlier in the week but that was before the no bread rule and you just cant have soup without bread, so i chucked it into a pan with some tikka powder, frozen spinach and a couple quorn fillets then stirred in some fat-free yogurt before serving. 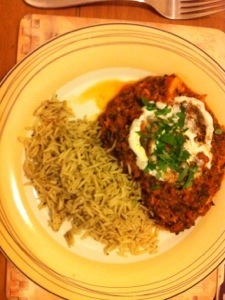 I was feeling a bit lazy so microwaved some Tilda lime and coriander rice (2 syns) to go with it. I’m writing my post early tonight as have things to do, but will finish off the rest of the pineapple at some point this evening and get an early night as I need my energy for tomorrows bike ride… well as long as it doesn’t snow to much that it. 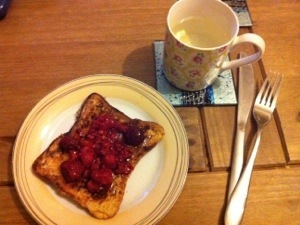 Managed to get up nice and early this morning and did a 10 min Pilates set before preparing an eggy bread (hexb) breakfast with Cinnamon and raspberries with a drizzle of honey (1 syn) and a mug of hot water and lemon to wash it down with. On arriving at the office, i was horrified to see the chocolate table had been restocked with some rather lovely looking chocolates, i thought I’d post a photo just so you can realise how hard it was to resist! 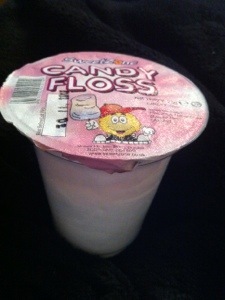 I had just two of these and as there was no nutritional info, i guessed at 2 syns each? they were pretty small, but delicious! 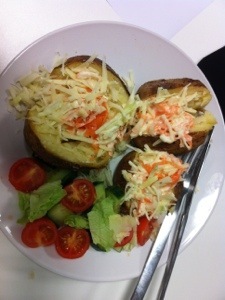 I’d put some jacket potatoes in with the chips last night so had these for lunch today with some homemade coleslaw and 40g of reduced fat grated cheddar cheese (hexa) and a side salad, it was massive and sooooo filling. 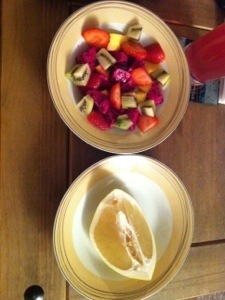 I still managed to get through a satsuma, apple, sw light hi-fi bar and some raspberries during the day too. So tonight was weigh in night, and i must say i was slightly disappointed at maintaining 😦 I have changed a few thing since last week though, I’ve not been focusing on eating superspeed foods as i was last week plus I’ve re introduced bread as my hexb again, so after having a chat with my lovely consultant, I’m going to try to cut bread out this week and see if this makes any difference to my weight loss next week. 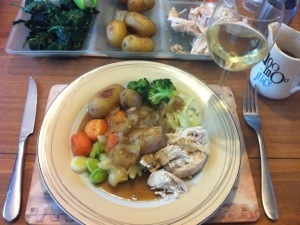 After coming home from tonight’s meeting feeling rather deflated, hubby had cooked a lovely lamb roast dinner for us, with SW friendly gravy, and lots of veg, and the table was laid with a glass of wine at my seat! (4.5 syns). 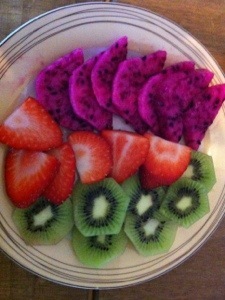 Followed by another colourful fruit platter. The day started with 10 minutes of Pilates (yes i remembered!) 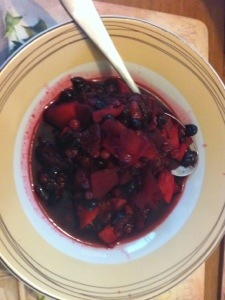 followed by a nice light breakfast of chopped fruit (so pretty! 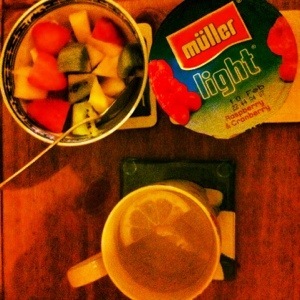 ), Muller light and hot water and lemon. Mid morning snack was a banana and a couple of cups of tea. Felt rather bloated for some reason (maybe last nights candyfloss expanding!?) so had a few glasses of water too. 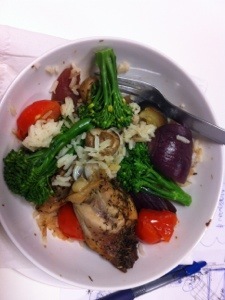 I’d packed up the rest of the chicken, rice and roasted veg left over from last nights meal to have for my lunch today, and threw in a few stems of broccoli too, everyone in the office was very interested in this little lot, especially compared to their boring old sandwiches! 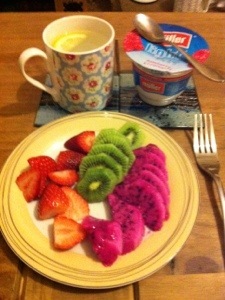 i managed to get through some more fruit, tea and mini rivitas during the afternoon, the bloating had gone and i was feeling much better, so made up for it by munching away all afternoon. Whilst on my little shopping trip yesterday I purchased some (rather unflattering) hat, gloves and base layer so there would be no excuse not to go to run club tonight – plus it’s the social next week and i felt i should turn up to run at least once beforehand! but I just couldn’t face it in this weather. 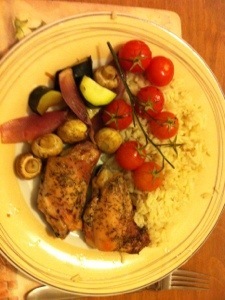 After i was done with work i raced home, got warm and got cooking. 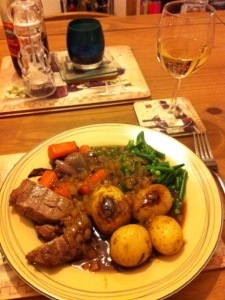 It was quite late so hubby had already sorted him self out, and i needed something quick and easy. 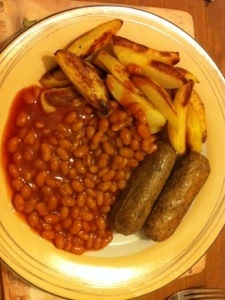 I’d brought some new wild garlic and parsley quorn sausages to try so had 2 of them (2 syns) with some SW chips and baked beans. 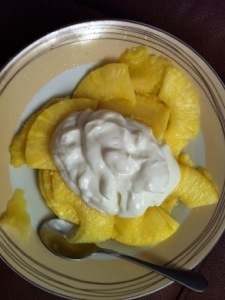 And to finish up i made use of my pineapple corer and slicer and had a big bowl of it topped with a greek style coconut Muller light… it was a but like a pina colada, SW style *well you have to use your imagination!